Media Capture is an easy and powerful tool to capture audio and/or video from audio/video capture devices or from desktop. In particular, Media Capture enables to capture jerkiness (image freezing) events which happen when a streaming service pauses the video in order to have the time to buffer some more data to decode. Thanks to this, Media Capture is the ideal companion for Video Quality Monitor in order to measure the impact of jerkiness on perceived quality. Media Capture automatically detects the video capture devices, audio capture devices, video codecs and audio codecs installed on your machine. Media Capture can run on virtually any PC. It can even run on a laptop. When you first start Media Capture, the audio/video capture devices and codecs installed on your machine are detected and you can choose the devices you want to use. 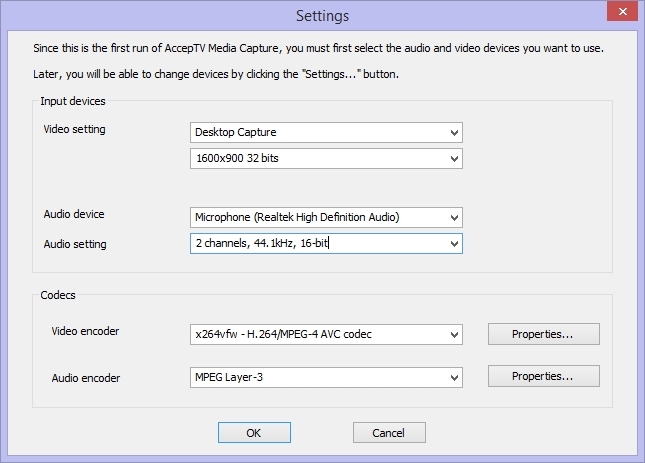 For each audio or video capture device, Media Capture detects the supported capture modes (resolution, sampling rate, etc.) and enables you to select the formats to use for capture. You can also define the encoding parameters, like bitrate (for audio and video codecs which support this feature). Desktop capture can be performed at various frame rates. You will also be able to change these settings during the use of Media Capture. Manual capture is quite simple to understand: the user must choose a destination file, decide if audio must be captured too, and enable/disable audio/video encoding. If encoding is disabled, captured data is saved in raw format. 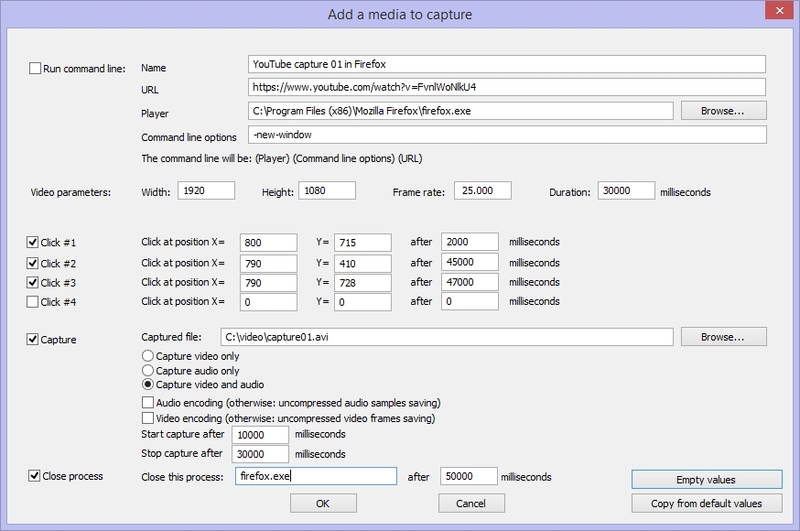 To schedule a capture task, the user must add a media to the capture list (by clicking on the "Add media..." button). Each operation is automatically triggered after a user-defined delay (expressed in milliseconds from the start). The command line (if required) is executed at the start. Concerning the destination file, you can decide if you want audio to be capture and you can choose if audio and video must be compressed (otherwise they are saved in raw format). Some buttons also enable you to load/add a list of media to capture, or to save the current list of media to capture. The current version of Media Capture enables to add up to 10000 media in a list. If you need more, just contact us. 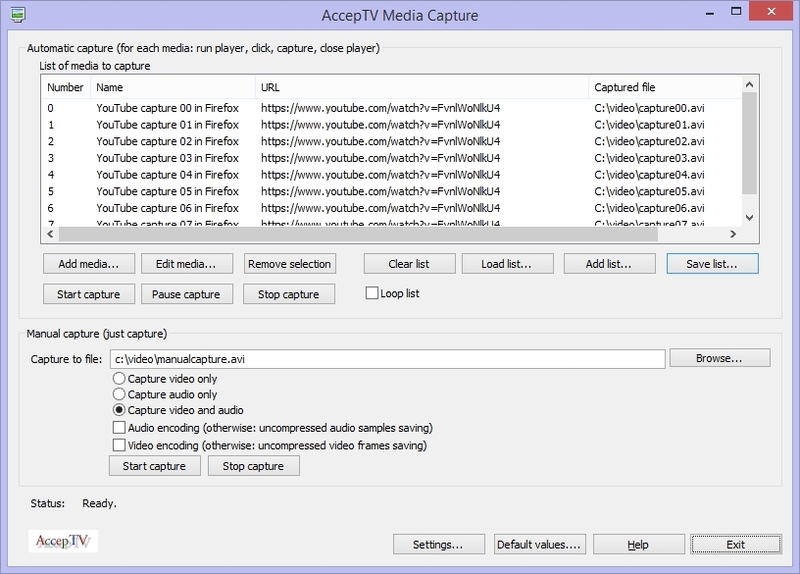 Media Capture is a very flexible tool to capture audio/video from desktop and from capture devices. It is the certainly the best solution to capture audio and video as they are presented to the user when played from any Internet browser (IE, Firefox, Chrome, etc.). In particular, Media Capture enables to save the jerkiness (image freezing) events which can happen during playing.